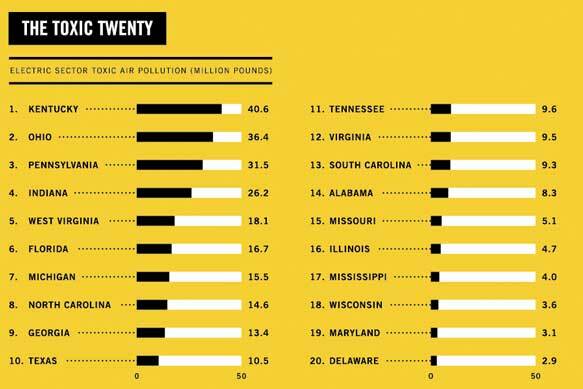 Air pollution – do you live in one of the ‘Toxic Twenty’ states? Residents of Kentucky, Ohio and Pennsylvania are exposed to more toxic air pollution from coal-fired power plants than in any other state. Continue reading Air pollution – do you live in one of the ‘Toxic Twenty’ states? Posted on September 2, 2012 Author robotchampionCategories defaultTags energy, envnironment, epa, good, health, nrdcLeave a comment on Air pollution – do you live in one of the ‘Toxic Twenty’ states?